The girl in question is named Max. A skateboarding ginger with anger issues, her game of choice is the 1982-classic Dig Dug. 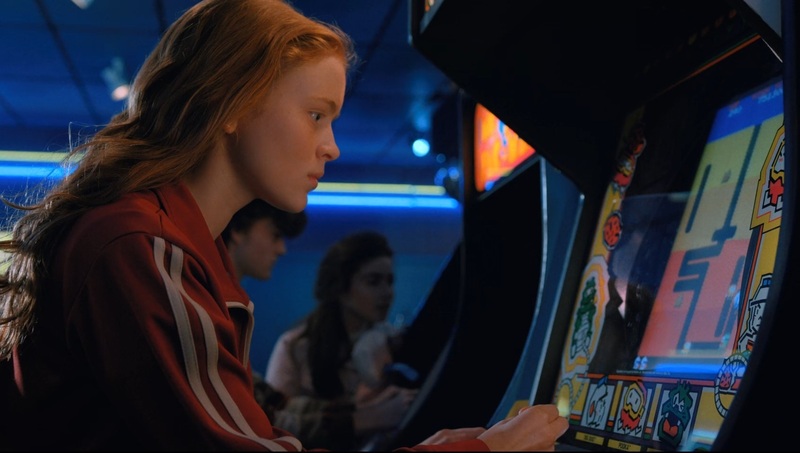 Upon discovering Max has beaten their high score at the arcade (Max’s pseudonym: Mad Max), Dustin and Lucas instantly fall for her. After all, she’s a gamer. She’s not like most girls they know; she’s like them. But despite that her one-of-the-boys attitude made them interested in the first place, the party still rejects her. Of course, there’s the whole the government will find and kill you if you spill their secrets thing hanging over them, but gender complicates the whole affair even more. She’s invited into the group because Dustin and Lucas have a crush on her but immediately they patronize her by assuming she wants protecting when they invite her to join them for Halloween trick-or-treating. After being rejected by Max romantically, Dustin turns sour and acts even meaner towards her — an obvious nod to his wounded masculinity. And Mike’s resistance to her seems to, bizarrely, stem from the fact that he thinks only one girl can be a part of the group at a time and he’s still holding out for Eleven. “When will boys stop” – Mad Max and also me. Even though nerd culture has evolved, grown, and dominated the entertainment and tech industries in the time since the 1980’s, girls and women are still excluded from these spaces, physical or digital. Message boards are reportedly hostile, Reddit has been taken over by the alt-right, and fandom spaces that are dominated by girls and women are ridiculed and seen as less-than, such as Tumblr. Gamergate was only three years ago, not thirty, and this year alone a Google employee circulated a memo claiming women were naturally, biologically less qualified to work in tech. Because these attitudes are still so real today, acknowledging gender relations inside the nerd community of the past can be useful in examining who really has the right to be “nerdy.” Stranger Things is a show that claims, by intention or by accident, monopoly on the presentation of nerddom, both as it was then and as it is now. If it’s going to introduce a female character, it has the obligation to do her historical context justice, right? 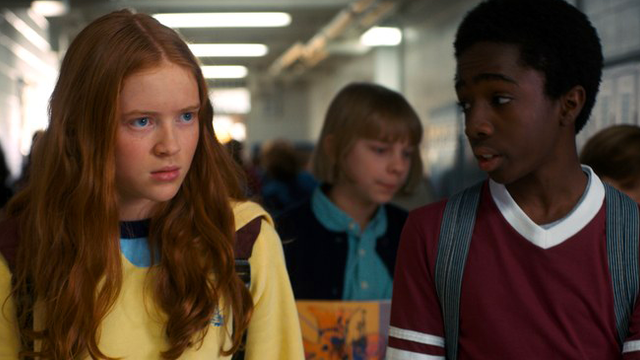 But instead of being interested in examining the nuanced situation that Max finds herself in, Stranger Things is mostly interested in reliving nerd boy nostalgia through Mike, Dustin, and Lucas. Real girls and women are accused of falsifying their interest in perfectly interesting things in order to get the attention of boys and men, and are thus easy targets for petty fictional villains. 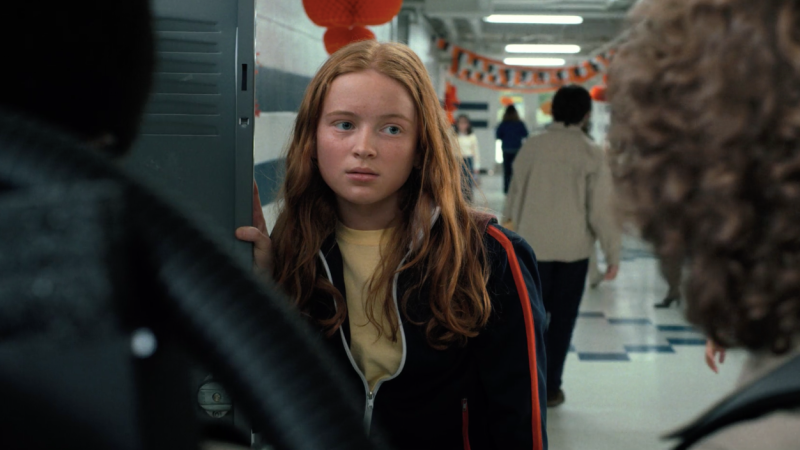 Likewise, Max’s real backstory is withheld from us for most of the season in an attempt to position her as a shady outsider infiltrating the boys’ group for personal gain — maybe, like Mike fears, to take the spot of Eleven, the only other girl any of them seem to know. Even when they first learn of Max’s gaming prowess, the boys claim she can’t possibly be that good, because “girls don’t play video games.” Is this a cute acknowledgement of gender bias from gamers in the 80’s? Or does the show jab at the boys’ childish sexism to gloss over the real discussion of gender necessary when introducing the nerd girl in such a setting? Max and Lucas, who I really did ship in the end. Obviously, we know that’s not true. Lucas tells her as much. But it isn’t that much of a stretch to assume, when boys who claim to be your friends regulate you to romantic interest and withhold key elements of friendship, that you’re being treated unfairly because of your gender. The narrative positions her concern about sexism as completely unfounded when only moments ago the boys struggled to get over their assumption that girls don’t game. Of course her concern is founded. Max, like anyone, has her own issues, and they aren’t all related to gender. We learn she’s a child of divorce and that she misses her real dad. We witness her abusive step-brother Billy take out his aggression on her. We learn that her new stepfather is also abusive. Max confides about her past in Lucas, and the two forge a relationship out of mutual trust. Max’s aggression is explained and we feel for her knowing what she’s gone through. To be fair to the romantic storyline, Max and Lucas’ relationship is sweet and forged from real bonds of friendship instead of some frivolous frothing over how cool and not like the other girls she is, but it’s still unclear how Max fits into the group besides being someone’s girlfriend. The show had plenty of opportunities this season to give her a purpose that could be filled by no one else, but opportunities were regularly glossed over. In episode five, literally titled “Dig Dug,” the solution to the riddle of the tunnels beneath Hawkins is given to a male character who likes puzzles instead of to the girl with the expert knowledge of the titular game. The writers sideline her existing character traits in favor of making her the group’s, um, “Zoomer,” or one-time chauffeur when she steals her step-brother’s car. No word yet on how this “Zoomer” role will work out when they’re all back on their bicycles next season. She is literally a professional at this game. Thankfully, her character arc is resolved through winning the day over Billy, not being romantically involved with Lucas, but the resolution in question fails to come across quite as badass as the writers might have hoped. She threatens to puncture Billy’s crotch with Steve’s weaponized baseball bat, and apparently this is enough to quell Billy’s abuse toward her for some time. The scenes preceding the vengeance show Billy’s father abusing Billy, linking that with why Billy takes out his aggression on Max. That violence begets violence begets yet more violence in abusive households is a big thing to grapple with. Is Max an abuse victim defending herself, a child learning how to handle conflict the wrong way from the adults around her, or both? We should be allowed to be worried for Max in this moment — but this act of violence gains the boys’ kudos at last, and the narrative moves on after male approval is achieved. Creators Matt and Ross Duffer have talked at length about basing Stranger Things off of the 80’s movies of their childhood — but also intending this show to bring that magic to kids of today, too. Reflecting the world you grew up in can be fun for people your age, and passing it on to a new generation is how the spirit survives. When we consume media set in the past, we have an obligation to interrogate the themes it brings forward. What do we want to survive? And what are we willing to let survive unquestioned? It seems, at least for now, acknowledging sexism in 80’s nerd culture would spoil the fun.